The thing about South Mumbai is that everywhere you go or turn to, you’ll find something that stands out. 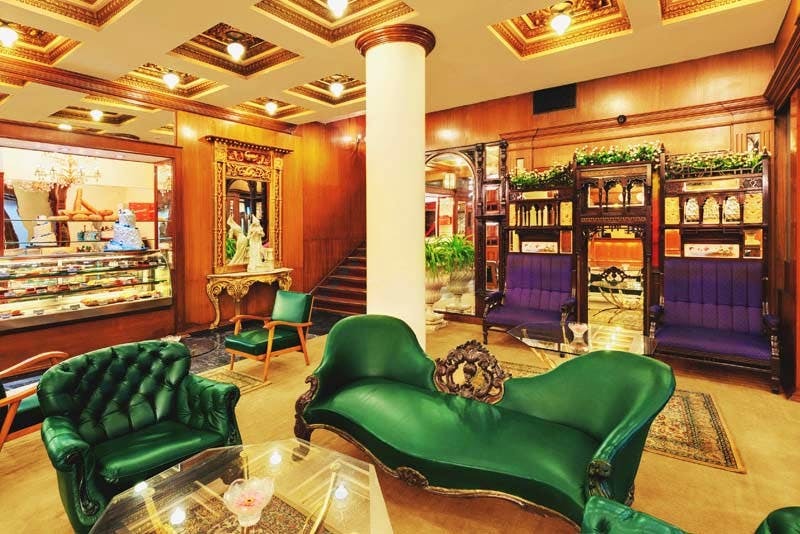 The Ambassador Hotel is one such instance, where heritage and timeless can be used as synonyms multiple times. Located so close to the Queen’s Necklace and a hop, skip and jump from the legendary Marine Drive, the Ambassador hotel has a history of its own. It was the first revolving restaurant the city ever had. You’d get a bird’s eye view of parts of town while enjoying a fine dining experience at the same time. As soon as you enter the almost 80-year-old hotel, you’ll see beautiful statues spread across the lobby. From Indian artefacts to even Grecian statuettes, it gives a sense of history that’s forgotten but must be remembered at moments like these. One usually gets a mental prompt to ask around and explore the place a bit more. The view from the hotel is spectacular – one side is the Wankhede stadium and the other, the sea and Marine Drive. You’ll see woodwork spread across the hotel, with emerald green furniture that reminds you of a Wes Anderson movie, symmetry being the key. The rooms and suites are stately, with all the amenities you can think of and some of the rooms even having tubs, a rarity in this city. There are conference rooms and meeting rooms in case you want to catch up with colleagues over a sumptuous meal. They have two dining options, one, a 24-hour coffee shop called Flavours where you get your usual fare of continental food and yes, beverages. The other being The Society, a fine dining restaurant that has been around for more than 40 years, serving culinary delights, both contemporary and traditional. Apart from visiting it for their food, spend some time here soaking in on Mumbai’s history and culture. What’s really interesting is that the staff has been serving there for generations, so it’s loyalty like nowhere else. Beyond this, it offers you a great view of the sea. What more could one ask for? If you book from their website, they currently have some pretty cool room and suite discounts, so make the most of it!